George Andrews needs Perry�s help. Andrews has just been in a car accident after visiting political fix-it man Wilfred Borden. The next day, Wilfred Borden�s murder is announced on the radio and the police bring in Andrews as the prime suspect, since he saw Borden just before his death. Perry suspects a setup and must find Dawn Manning, the girl Andrews swears was in the car accident with him. When Andrews mentions that Dawn�s a bathing suit model, Perry gets an idea. He poses as a photographer and advertises for subjects. 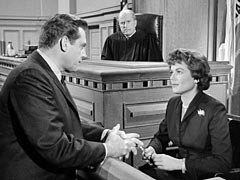 This episode, which originally aired at 7:30pm on Barbara Hale's 37th Birthday (a Saturday), is unusual in that Perry calls Della Street to the witness stand to provide an alibi for the defendant. --Submitted by 10yearoldfan, 9 June 2012. CARS: 1957 Ford Ranch Wagon 2dr, medium & white color, 1957 Plymouth Savoy V8 2dr hardtop, dark color w/ white top, 1959 Ford Custom 300 4dr sedan, light color (Taxi), 1958 Cadillac convertible, black, white top up (Mason)*, 1959 Cadillac series 62 convertible, black, white top up (Mason), Cameos: 1957 Ford Fairlane 2dr sedan, dark & white color, 1957 Buick convertible, dark color, white top up, *reuse of footage from an earlier episode. From The Cars by Greg Cockerill. Loretta Harper has the same barometer in her apartment that hangs on the wall of Wilfred Borden�s living room. Submitted by PaulDrake33, 7/29/2008. Sightings: During the first part of the hearing Little Old Lady in A Hat sits behind Perry Mason and appears in many shots. Distinguished Gentleman #1, and Quiet Old Man #1 are on the prosecutor�s side. Submitted by gracenote, 5/23/2011. + We can see the all three clustered together among the courtroom audience after the hearing reconvenes. DG#1 is wearing glasses, and at one point the Lady whispers with him. More about them on this page. Originally submitted by gracenote, 8/28/2010; updated 5/23/2011. + �Miss Carmody� is seated just behind Perry next to the aisle. Submitted by alan_sings, 9 Oct 2010. Little Old Lady #2 is visible during the first part of the hearing, in the front row. During the second part, she is in the back row next to Little Old Lady #1, who has magically teleported from the other side of the courtroom (see above). Submitted by gracenote, 5/23/2011. Goof: While Dennison is testifying, he is also seated behind Frank Fettridge in a closeup of the courtroom gallery. Only the corner of his glasses is visible in this shot, but his seating location is confirmed in other gallery views later on. Submitted by alan_sings, 9 Oct 2010. *(Which would have been William Hopper's 102d Birthday. Noted by Notcom 012817). Dean Harens who plays Frank Fettridge make the first of four appearances on Perry Mason. Mr. Harens is without a doubt the smarmiest character to appear on Perry. Every time he comes on screen, I have this terrific urge to run up and begin to choke him. Submitted by PaulDrake 33, 29 July 2008. + He has 85 IMDb credits; the 3 other Perrys were "Paul Drake's Dilemma," "Wandering Widow" & "Fatal Fortune." Mike Bedard 6.27.16. It�s interesting to note that Perry episodes get less racy as the years go on. For example, in this 1959 episode, Dawn Manning�s bikini is quite skimpy. But in 1964�s TCOT Blonde Bonanza, Diane Adler�s bikini is comparatively modest. It�s as though the sexual revolution works backwards on this show! Submitted by Ed Zoerner, 3/6/2011. The shield-and-axe decoration over Borden�s mantle is exactly like one that hung on the wall of my grandmother�s den. I have no idea what it is or where it comes from, but I wonder if it wasn�t uncommon in the 1950s? Does anyone know anything about it? Queried by gracenote, 5/23/2011. Glove Compartment SWITCH: Usually a pistol is TAKEN; in this case, the weapon is put IN. Mike Bedard 6.28.16 MeTV airing.